North Carolina seceded from the union on May 21, 1861, and was one of the last states to do so. The state would send more of its men into war than any other in the Confederacy, and suffer the most casualties. A lesser, but substantial, number would fight for the Union. Western North Carolina saw no major battles, but was contested territory despite being under Confederate control. The area was home to Confederates, Unionists, and neutralists, white masters and black slaves, poor farmers and marginalized Native Americans. Some stayed loyal to their initial cause, and some switched sides. To this day, historians debate just where the region’s loyalties lay. The milestones marked here offer a sampling of the myriad and dramatic ways the Civil War impacted life in our mountains. May 6, 1865: At White Sulphur Springs, near present-day Waynesville, Union and Confederate troops trade the final volleys of the war east of the Mississippi. There are no casualties. 1862: William Thomas, the first and only white chief of the Cherokee Indians, forms a unique unit of white and Indian soldiers to fight for the Confederacy in North Carolina, Tennessee, and Virginia. April 6, 1865: Members of the loosely organized Confederate militia turn back an attempted attack by 1,000 Union troops from Tennessee. The conflict causes few, if any, casualties, but keeps Asheville—home to a Confederate armory and prison—in rebel hands for the final three weeks of the war. April 1864: In an episode that evidences just how divided some WNC communities are about the war, a squad of about 75 pro-Union irregulars led by Confederate deserter Montreval Ray shoots a local Confederate recruiter and ransacks supply and ammunition stores, absconding with 500 pounds of bacon and more than 100 guns. The day before, a group of about 50 women with similar sentiments swiped 60 bushels of wheat from a government store. June 28, 1864: From a base in eastern Tennessee, 130 Union troops and partisans led by Colonel George Kirk stage a daring infiltration behind enemy lines and raid Camp Vance, a Confederate training base near Morganton. After destroying the camp, Kirk’s men fend off rebel pursuers and make it back to Knoxville with some 130 prisoners. October 1863: With eastern Tennessee having recently come under federal control, Union troops increasingly make forays into WNC, seizing Warm Springs (current day Hot Springs) for part of October before retreating. January 1863: In one of the most searing atrocities of the war in the mountains, 13 men and boys are summarily executed by Confederate troops. The massacre takes place shortly after a raiding party thought to have Unionist sympathies robs a government supply of salt, which was a scarce commodity needed to preserve meat. March 1865: Launching the largest Union operation in WNC during the war, Major General George Stoneman leads 6,000 troops from Tennessee, striking first in Boone. 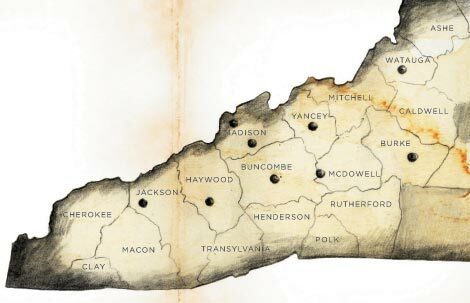 His forces, which are then separated into smaller units and dispersed to parts of Virginia and the Carolinas, steadily overcome remaining Confederate pockets of resistance in the coming weeks. April 20, 1865: 500 Confederate troops ward off an attempted Union incursion of Asheville. The federal forces reroute their raid southwest through the Hickory Nut Gorge, and make their way to the target by way of Hendersonville. take part in discussions about our region’s Civil War history. At its monthly meetings, this informal group of history buffs gathers in Sylva to discuss local aspects of the Civil War. It also coordinates special events, including field trips to points of historic interest, and battlefield preservation efforts. Michael C. Hardy, a noted Spruce Pine historian, regularly updates his blog (www.michaelchardy.blogspot.com) with news about nearby reenactments, seminars, and readings. www.nccivilwar150.com is a hub for information about official events and publications relating to the war’s anniversary.